Despite this being the opening day of deer hunting season, three of us chose to drive down U.S. 395 to the vicinity of Silver Creek. This is accessed through the MWTC Marine base along Highway 108. Maybe a hundred hunters were in the area. We braved the flying ordinance and were stopped by a DFG game warden who checked us for guns. We quickly hiked up the hill toward the peak, to get out of range. Soon, we were beyond most of the gunfire, and up at higher elevation. This was an easy climb, with the gain being less than 2,000 feet, over only a mile or two as the crow flies each way. We reached the summit ridge where Pat and me braved posing standing or sitting on a pinnacle. We didn't know of anyone else who had made this climb. This was new territory. We found a devious, class three, way up to the highpoint of the middle crag. It is about level with the north crag, which is much easier. We climbed all three potential highpoints, being thorough peak climbers. Having lots of time, we hiked about the summit area. 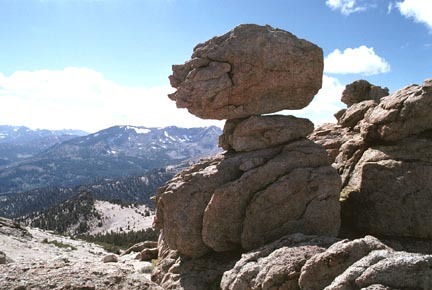 We found a balanced rock, and had fun with pictures. It actually rocked, and I thought that a helicopter may have placed it, as it didn't look real natural. We looked about some more, then descended back to the war games below. This trip was initially planned to go to a National Park, where hunting is restricted or forbidden, but we didn't wish to do the extra driving. I never knew how many hunters could be in one area. Passing truckloads of rifle-wielding recreationalists on the dirt road going down, I was glad that nothing tragic had happened. It was almost akin to being in combat!